As we near the end of the Spring 2018 semester, here are some recent accomplishments by our talented students and faculty, as well as recognition of University of Redlands administrators and staff. 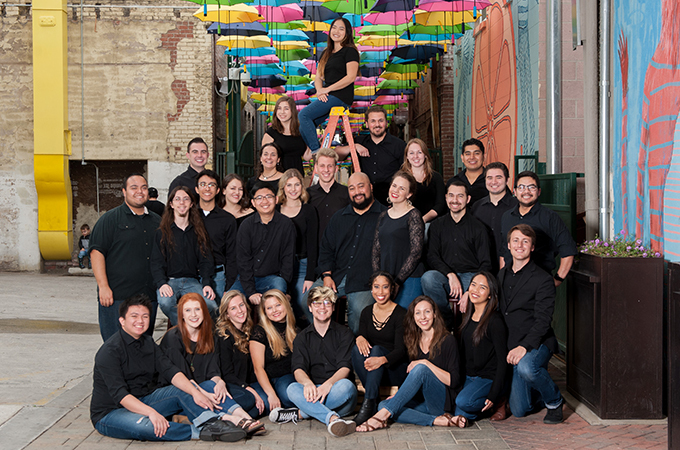 U of R’s Chapel Singers, an advanced 27-voice chamber choir composed of undergraduate and graduate students, was the only U.S. group selected to participate in Canada’s National Choral Conference and Festival, “PODIUM on the EDGE: Singing from Sea to Sea.” The group will travel to St. John’s Newfoundland and Labrador for the festival June 29 to July 3. As announced at this week’s University of Redlands Spatial Learning and Research Symposium, undergraduate student Elamar (“Ely”) Hienrich '18 and master’s student Blythe Spendlove ’18 have been awarded the Roger Tomlinson Award for Excellence in GIS, which recognizes strong research and academic capabilities in the field of geographic information science (GIS). College of Arts and Sciences (CAS) students Mary Andreas ’18 and Selena Phelps ’19 have been awarded U.S. Department of State’s Benjamin A. Gilman International Scholarships, funding participation in U of R’s Salzburg Semester and the SIT Study Abroad’s Tanzania: Wildlife Conservation and Political Ecology program, respectively. 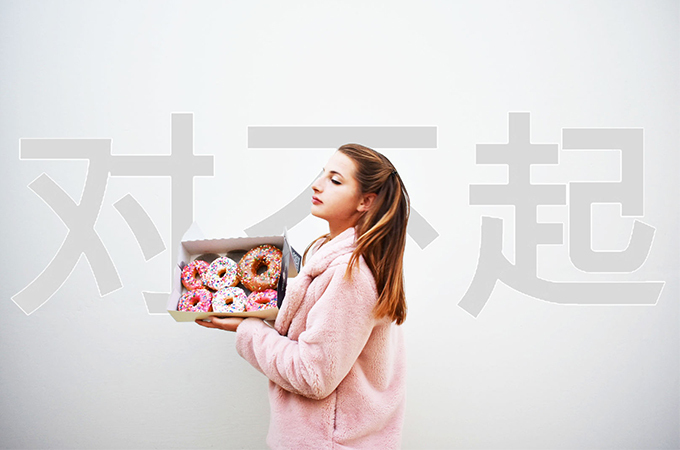 Marguerite “Greta” Jursch ’21 won a silver for her entry, “Sorry,” in the Elements of Advertising, Still Photography/Digitally Enhanced category of the American Advertising Awards, Inland Empire Student Competition, presented at a gala held at Riverside’s Mission Inn in March. Through the Office of Community Service Learning, Dominick Sullivan ’21 and Carly Vessels ’20 are receiving $500 scholarships as part of the California Campus Compact-Community Engagement Student Fellowship (CESF) initiative, a program designed to support student leaders advancing service, service-learning, and community engagement. Nominated by the Jasper’s Corner Homework Club student directors for exceptional tutoring, the students complete a term of service of at least 50 hours to receive the scholarship funds. Aditi Bhatnagar ’20 received the award last semester. School of Music graduate student Austin Davis ’14 ’18 was named a semi-finalist conductor in the band/wind ensemble division of The American Prize national nonprofit competitions in the performing arts for a performance conducting the University of Redlands Symphonic Band, a 65-piece wind and percussion group. In addition to the many international awards acknowledged as part of the Global Business Dinner, Innovation Fund Language Scholarships have been awarded to Lili Diab ’20, who will study Arabic at the American University of Lebanon, and Michael Strecker ’96 ’20, a graduate student in the School of Education Master of Arts in Learning and Teaching (MALT) program, who will study German at the Goethe Institut, Berlin. 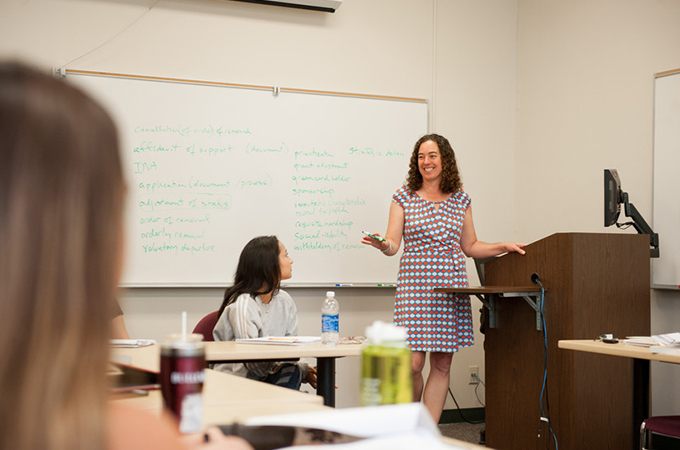 Sociology and Anthropology Professor Kimberley Coles was selected as an awardee for the ASIANetwork Enhancement Seminar, “Religion in National and International Affairs in China and India,” this summer. A consortium of over 170 North American colleges, ASIANetwork strives to strengthen the role of Asian Studies within the framework of liberal arts education to help prepare undergraduates for a world in which Asian societies play prominent roles in an ever more interdependent world. Cheryl Matta (second right), student financial services coordinator, and Rachel Roche (second left), assistant director of athletics, receive congratulations from URSAA’s Kelly Jones (left), Courtney Carter (center), and Kristin Grammer. 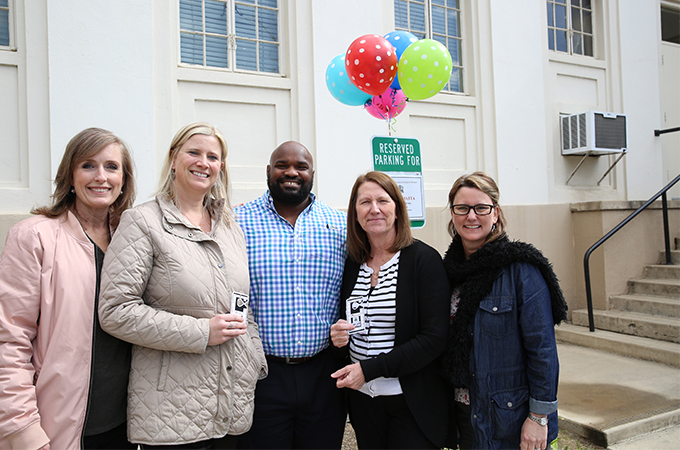 Cheryl Matta, student financial services coordinator, and Rachel Roche, assistant director of athletics were this semester’s winners of reserved parking spaces near their buildings through the University of Redlands Staff and Administrators Assembly (URSAA) Appreciation Initiative. The winners were selected from a list of staff and administrators who submitted an URSAA Appreciation Initiative Eligibility Form; URSAA will be looking for next semester’s entries in August. Reggie Robles (left) of Campus Diversity and Inclusion and Sebastian Rivera of Student Affairs hold plaques from NASPA Student Affairs Administrators in Higher Education. 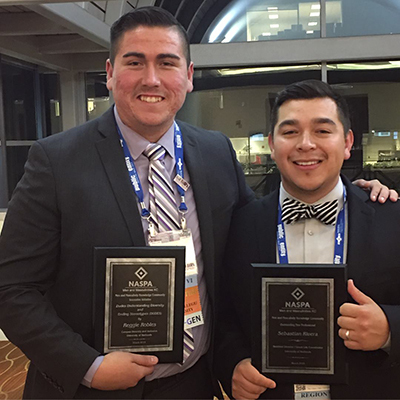 Reggie Robles, associate director of Campus Diversity and Inclusion, and Sebastian Rivera, East Hall resident director and coordinator of Greek life, received awards from NASPA Student Affairs Administrators in Higher Education (formerly the National Association of Student Personnel Administrators). Robles received the Innovation Initiative Award from the Men and Masculinities Knowledge Community; Rivera received the Outstanding New Professional from the same group. Coach Mike Maynard was among those honored with a 2018 Town & Gown Award of Distinction, which honors community members who have shown exemplary commitment to the public good through volunteerism, community involvement, or outstanding achievement in their field. In addition, Maynard was recently inducted into the Inland Valley Sports Hall of Fame. Who should we acknowledge in our next Kudos Corner? Email your suggestions to bulldogblog@redlands.edu. Bulldog Athletics highlights will be covered in a separate post.